On the winter blot the shadow of the higher stone passes across the lower stone 11 m away, allowing the shadow to just reach the top of the lower stone. The gradients of the top of the stones are in good alignment with the sun’s path. The shadows movement across the stone is exactly correct based on 2st January 645, exactly a half moon cycle after the winter solstice. However note that the shadow has a step corresponding to one day difference in height. It could mean that the first possible day for winter solstice actually took place a day earlier, ie on 1nd January. There is no problem in seeing how the shadow sweeps across the stone in real time. The next date on which this will occur is December 29st 2014, between 13:12 and 13:24. That day is just 8 days after the winter solstice and not a half moon cycle (approx. 15 days) applicable as earliest date for blot. 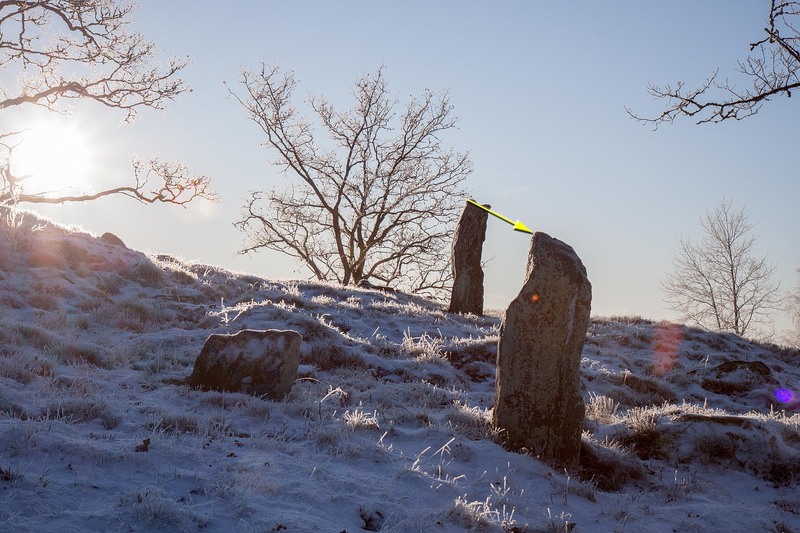 The reason is that the sun’s path in winter today is about 0.2 º higher than in the Late Iron Age.